I’m kinda blown away by Omaha Steaks on this one! Audrey is working with them as an ambassador this year and so we created this at home. Omaha Steaks has you covered all the way for Thanksgiving. They have a full Thanksgiving Dinner that you can order and have delivered and then make for Thanksgiving! They make it as easy as 1-2-3! 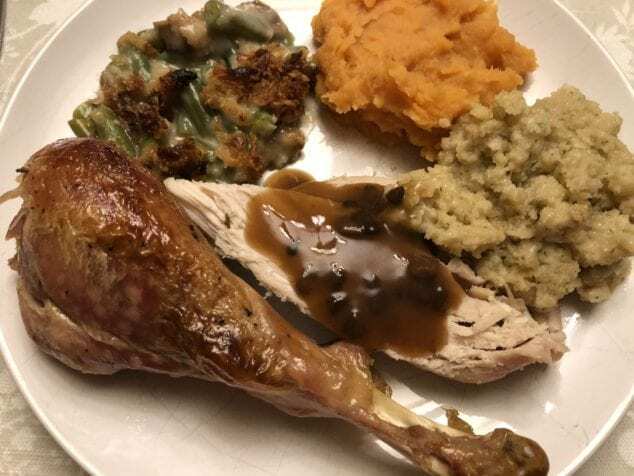 It is a Thanksgiving Dinner that ANYONE can make, even my wife! LOL! 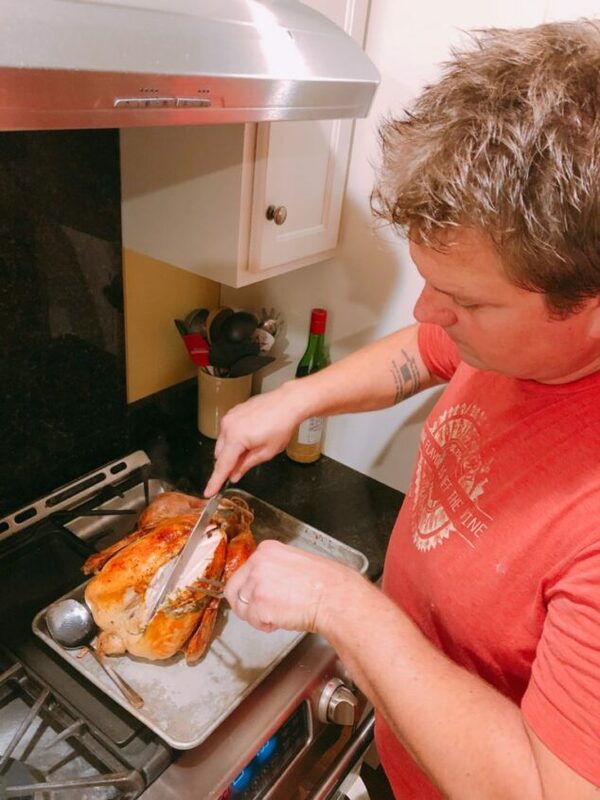 First off… the “big guy!” You need a TURKEY for Thanksgiving Day Dinner. 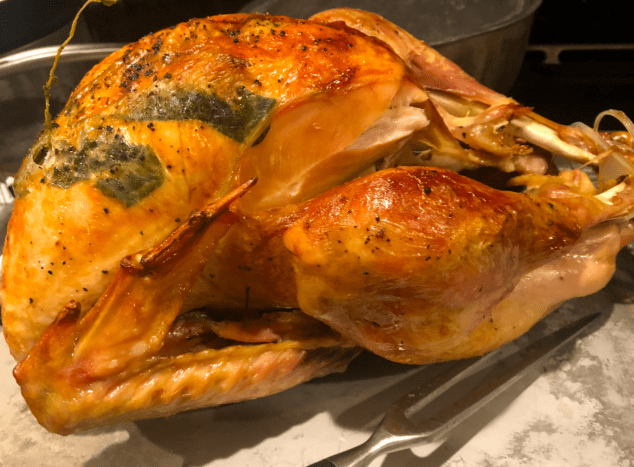 Omaha Steaks has a Whole Basted Turkey that is INCREDIBLE! I mean, INCREDIBLE. Their team of dedicated master butchers are proud to deliver a bird that’s big on flavor without any of the stress of getting it right. Our premium 10 lb. turkeys are naturally juicy and sweet, accentuated with a brown sugar and honey baste that keeps things moist and adds to the flavor. Part of the secret of the guaranteed perfection is the included cooking bag – it insulates the turkey during cooking to create juicier meat while allowing the skin to crisp to the ideal texture. You’ll also know exactly when it’s done – a small pop-up timer is already in the turkey, so it’ll tell you when it’s time to take it out of the oven. The whole package is delivered frozen from America’s Original Butcher in an attractive burlap bag, ready to thaw in your refrigerator before the big day. You’ll love the simple, easy-to-follow instructions and guaranteed tasty results. And side dishes, too. I couldn’t believe it. We dined on Whipped Sweet Potatoes and Green Bean Casserole! Omaha Steaks Mashed Sweet Potatoes blend the succulent flavor of southern sweet potatoes with brown sugar, butter and whole milk for a tasty side dish that is sure to become one of your favorites. Traditional green bean casserole made with green beans, French-fried onions, mushrooms, milk, and butter has an incredible homemade taste. The perfect side dish for beef, pork, poultry and seafood. Just heat and serve! TURKEY — There is some work ahead of time for the turkey, but it’s not difficult! 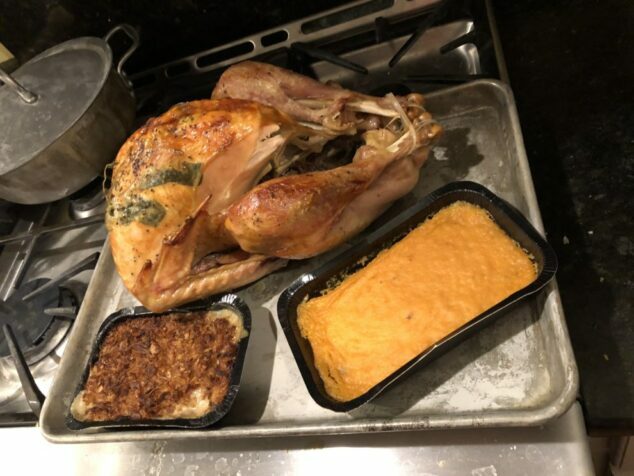 After you receive it from Omaha Steaks you thaw it completely in refrigerator 3-4 days or keeping turkey in vacuum sealed packaging, place in a sink full of cold water for 5-7 hours, changing the water approximately every 30 minutes. 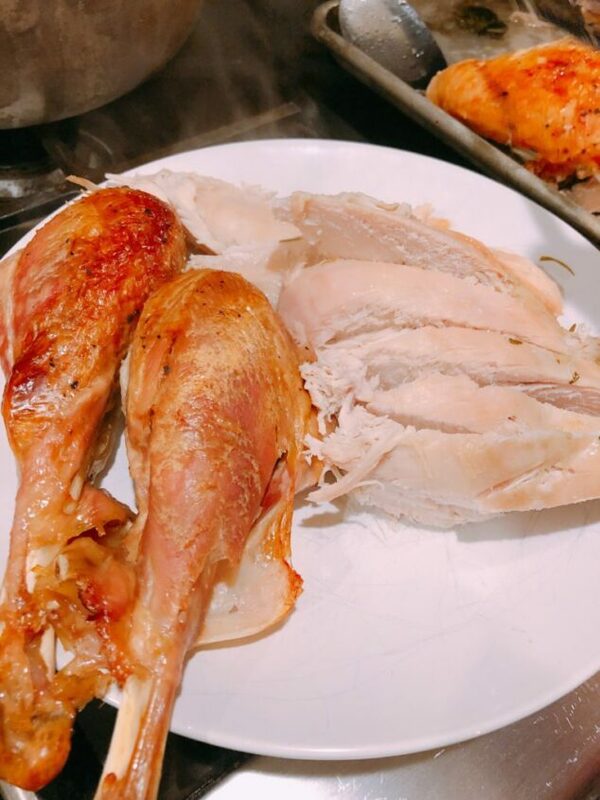 Once that’s done – cooking wise – Turkey will take 2 hours 45 minutes to 3 hours to cook. Everything is done for you – there’s no special rubs you need to do or any special seasoning, it’s DONE! POTATOES – GREEN BEAN CASSEROLE — 30 minutes to heat up in the oven. Even dessert, too! 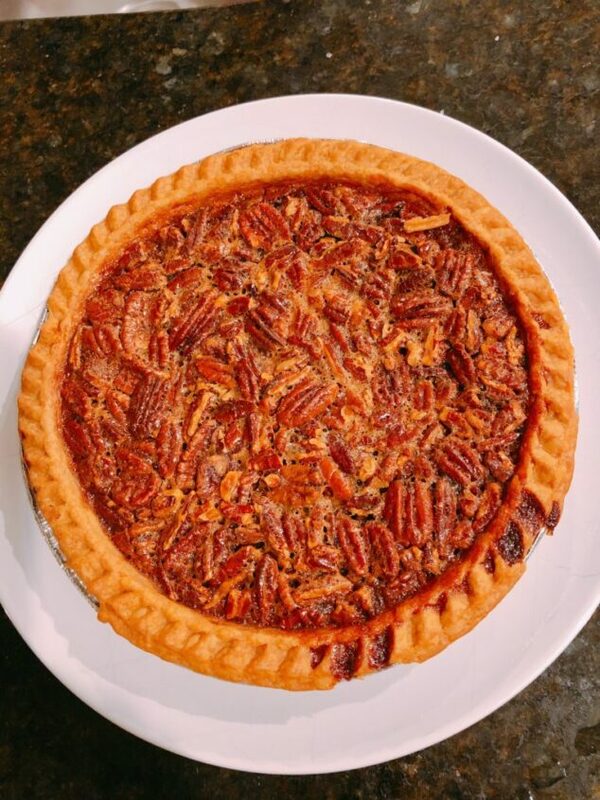 Omaha Steaks has a Pecan Pie that comes delivered right to you… in perfect deliciousness! Want a little slice of heaven? Cut into Omaha Steaks homemade Pecan Pie and discover a world of sweetness. As you slice, you’ll uncover layers of roasted, top-grade, Georgia-grown pecan pieces and pecan halves, sticky brown sugar filling, and dense, creamy custard. It’s a thicker, richer, totally loaded pie that offers more pecans per bite than any other. All this incredible filling is pre-baked into our flaky pastry crust, made the old-fashioned way without preservatives. Pecan Pie is certainly a tradition, but it’s never been done quite this decadently. It’s EVERYTHING. You know how easy it was to make? Thaw in refrigerator overnight or at room temperature for 4-5 hours. If desired heated, remove plastic packaging but leave pie in foil pan. Place pie on a foil lined baking sheet. Place pie on center rack in oven. Bake pie in a preheated 350°F oven for 15-20 minutes. Rest pie 5-10 minutes before slicing and serving. Single slices can be plated and heated in the microwave for 20-25 seconds on HIGH heat. VIOLA! Omaha Steaks delivers the Easiest Thanksgiving Dinner That Anyone Can Make.